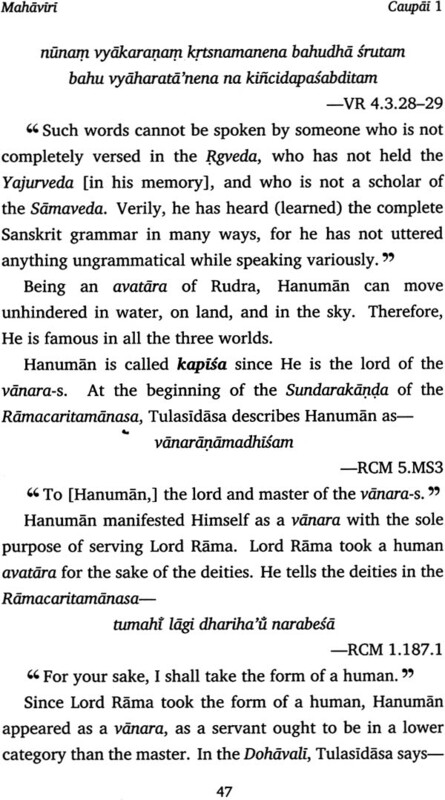 The Mahaviri is a Hindi commentary on the Human-Calisa authored by Padma Vibhushan Jagadguru Ramanandacarya Svami Ramabhadracarya. Although without eyesight since infancy, the Guru holds PhD and DLitt degrees in Sanskrit, speaks 22languages, and has authored over 100 books. Nityananda Misra works as a quant in the investment banking industry in Mumbai. He studied management at IIM Bangalore. Now at Citigroup, he has previously worked at Goldman Sachs and Morgan Stanley. Svami Ramabhadracarya is a Guru, scholar, poet, polyglot, author, singer, composer, playwright, philosopher, commentator, educationist, and katha artiste based in Chitrakoot, India. Born as Giridhar Mishra at Shandikhurd village in Jaunpur district on 14 January 1950, he lost his eyesight at the age of two months, and had no formal education till the age of seventeen. He received BA (1974), MA (1976), PhD (1981), and DLitt (1997) degrees in Sanskrit from Sampurnanand Sanskrit University, Varanasi. He was initiated as a virakta samnyasi in 1983, and anointed as Jagadguru Ramanandacarya in 1988. He is the founder and lifelong chancellor of the Jagadguru Rambhadracharya Handicapped University (JRHU), a university exclusively for the differently –abled at Chitrakoot. He has authored more than 100 books-including four epics (Arundhati, Sribhargavaraghaviyam, Astavakra, Gitaramayanam) and commentaries on major Upanisad-s Bhagavad Gita, Brahma Sutra, Astadhyayi, Ramacaritamanasa, Bhaktamala, and Hanuman-Calisa-in Sanskrit and Hindi. He has been awarded Padma Vibhushan (2015), Yash Bharati (2015), Devbhumi Award (2011), Vachaspati Award (2007), Vani Alankaran (2006), Sahitya Akademi Award (2005), President’s Certificate of Honour (2004), Mahamahopadhyay (2000), and many other honours and awards. He is one of the Prime Minister’s navaratna-s for the Swachh Bharat Abhiyan. Among the many deities that are held in high esteem by Hindus around the world, there are two zoomorphic deities: Ganesha and Hanuman. These are perhaps the most popular in the Hindu pantheon. No prayer or event can start without a prayer to Ganesha. Hanuman is also extremely popular, not only because he is so closely associated with Sri Rama and the Whole Ramayan epic, but also because he is looked upon as a manifestation of Shiva’s eleven Rudras. As a result, magnificent temples to Hanuman have been built around the country. The most impressive one that I have seen is at Suchindram in Tamil Nadu which houses a massive statue of Hanuman. Hanuman is depicted in two different ways. The more popular is as Ram Bhakta Hanuman, an intergral member of the Ram Darbar where he is seated in a posture of reverence before Sri Rama, Sita and Lakshmana. In another from he is shown as Veer Hanuman, standing alone and carrying his great mace. Needless to say he commands equal reverence in both these postures. Down through the ages a large number of hymns and stotra-s have been composed in honour of Hanuman –also known as Mahavir . 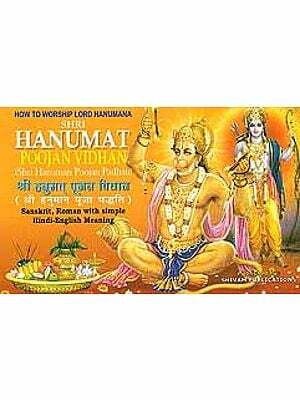 Of these the most popular is Goswami Tulasi Das ‘s famous forty –verse hymn to Hanuman called the Hanuman chalisa. 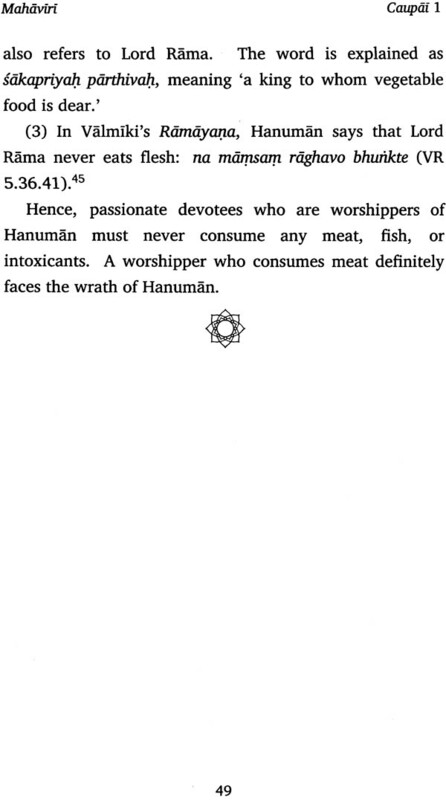 This is recited by millions of Hindus everyday around the world. However, analytical work on this text is ont easily available. In the present book Shri Nityanand Misra has translated and annotated the text based on the acclaimed Hindi commentary Mahaviri (1983) by Swani Ramabhadracharya. This throws a great deal of light on the deeper meaning of Tulasi Das’s famous work, and will be welcomed by scholars and laymen alike. I commend Shri Nityanand Misra for the devotion and dedication with which he has undertaken this work. Forty –three verses. 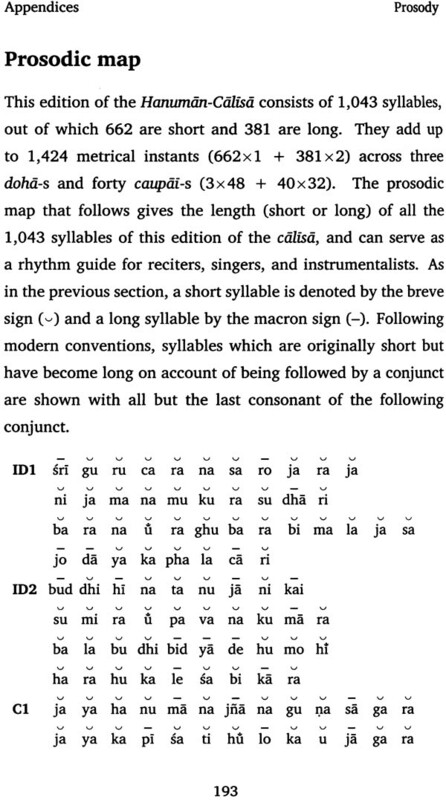 One thousand and forty –three syllables. One thousand four hundred and twenty-four metrical instants. That is the length of the most popular Hindu prayers across the world. 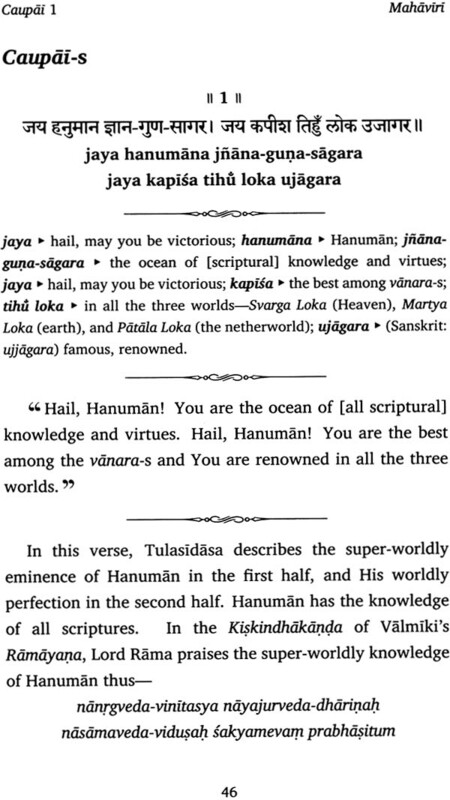 For several hundred of years, these 43 verses, 1,043 syllables, and 1,424 metrical instants of the Hanuman-Calisa have been a source of hope, peace, strength, and spirituality for innumerable Hindus. Millions of Hindus (and many non-Hindus too ) recite the Hanuman-Calisa every day-in northern India most practising Hindus know its text by heart. Many more Hindus and non- Hindus have recited it or heard it at least once in their lifetime. 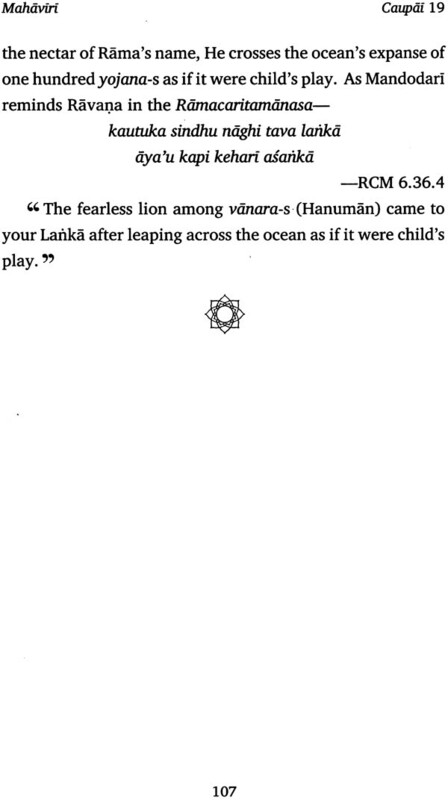 Quite like the majestic Hanuman who leaped across vast expanses of ocean and land, the Hanuman-Calisa transcends across diverse educational, social, linguistic, musical, and geographical boundaries. The most learned Brahmins recite the Human-Calisa with elaborate rituals lasting up to 108 days, and the most common masses recite it with minimal rituals on the community feast Tuesday (Bada Mangal days) of the Jyestha month (May –June ) in Lucknow. The rich van buy the Hanuman –Calisa printed as a book for as much as RS 40,000 (US $ 605)by placing special order with jewellers who use gold to write the text, the middle class can buy the ‘gold plated ‘ book for around RS 500 (US $ 7.56) from e-commerce websites, the poor can buy the high quality book published by the Gita Press for as less as Rs 5 (eight US cents), and renunciant sadhu-s are offered the calisa books for free at religious congregations. The calisa is in the Awadhi language which is spoken in central Uttar Pradesh by hardly three percent of India’s populace. And yet, those who recite the calisa include speakers of Hindi, Bengali, Telugu, Marathi, Tamil, Gujarati, Kannada, and numerous other Indian and foreign languages. Translation and transliterations of the calisa are available in most major languages and scripts of the world. While the rendition of the calisa in the mellifluous voice of the late ‘Dadaji’ Hari Om Sharan is by far the most popular one across temples and homes of the devout, the long list of singers who have rendered the calisa in their voice includes bhajan singers like Anup Jalota and Ravindra Jain, Hindustani vocalists like Pandit Jasraj and Rajan and Sajan Mishra, Carnatic vocalists like M.S. Subbulakshmi, celebrities like Amitabh Bachchan(in chorus with twenty other singers), and popular playback singers like ‘Bharat Ratna ‘ Lata Mangeshkar, Mahendra Kapoor, S.P. Balasubrahmanyam, and Udit Narayan. There is no region of India where people are not familiar with the Hanuman –Calisa, and with the Indian diaspora, it has reached most parts of the world in the twenty-first century. 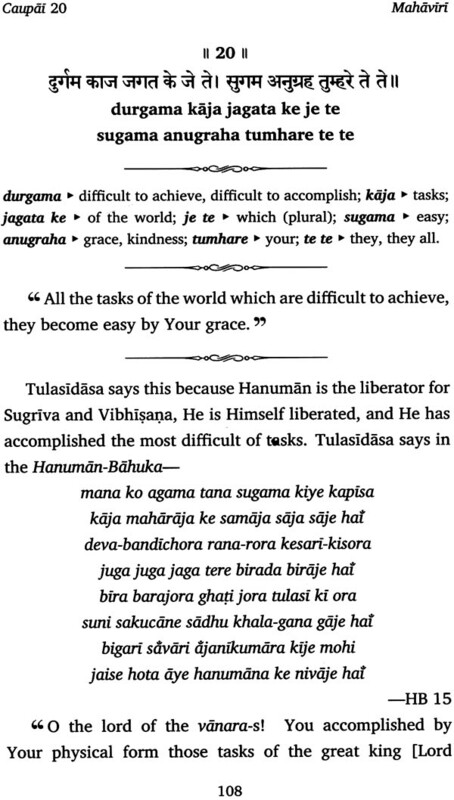 Like many friends of mine , the Hanuman-Calisa was one of the first prayers I learned. 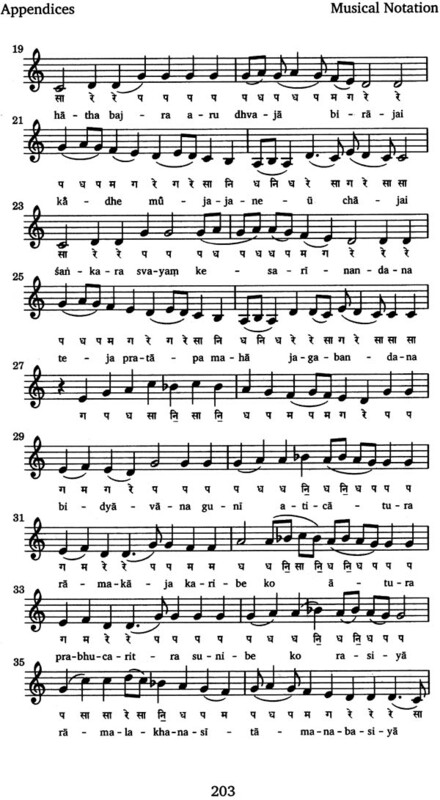 Over a period of more than twenty-five years, I have recited it or sung it thousands of times, and yet, until two years ago I was yet to come across a scholarly exposition or commentary on the hymn. While several good translation were available, none of them came close to the level of a traditional Indian commentaries (tika). 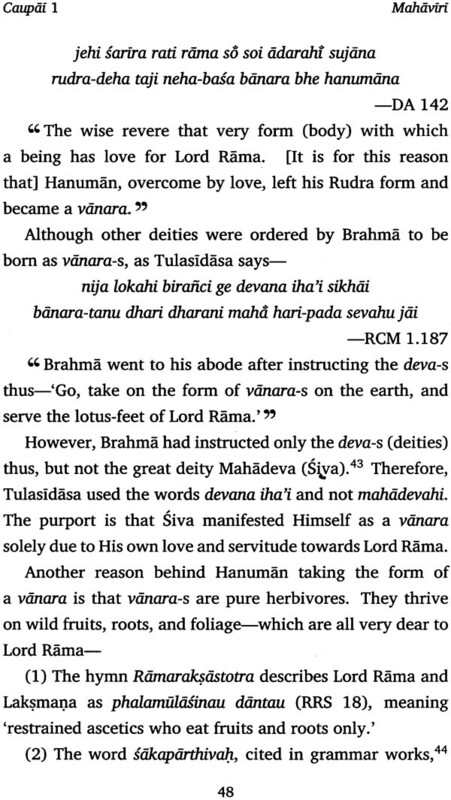 In the Indian literary tradition, commentaries have a very important place starting right from the Veda-s. As an example, there is no lover of Kalidasa who is not familiar with the commentaries of Mallinatha on the works of Kalidasa. For more than one thousand years now, every serious student of kalidasa has been guided by Mallinatha;s commentaries. 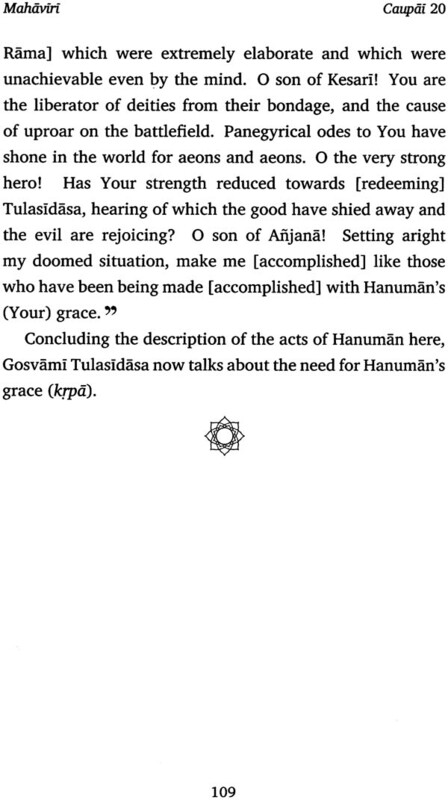 With the correct anvaya (logical connection of words), grammatical analysis, supportive evidence from scriptures, and crystal-clear thinking, a commentary gives its readers not only an accurate interpretation of the original text, but also offers deep insight into the works which would otherwise take readers years and years to develop. It was in 2013 that I finally got a copy of the long out-of-print Mahaviri commentary in Hindi by my Gurudeva, Jagadguru Ramanandacarya Svami Ramabhadracarya- the polymath and polygoly saint of our times. 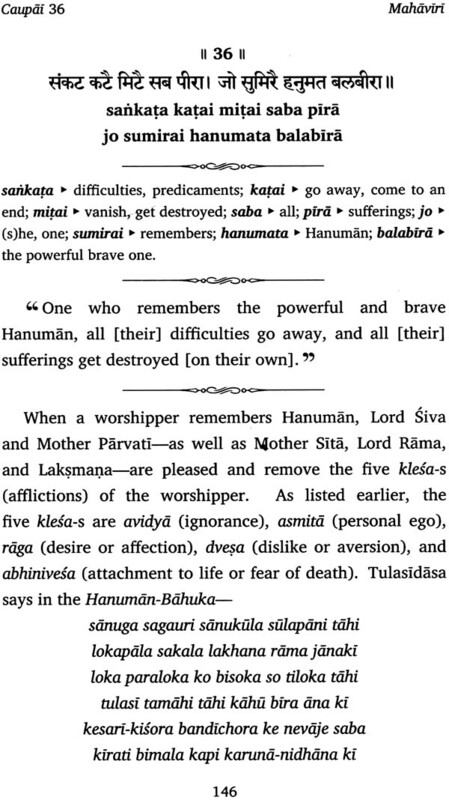 This short commentary, first published in 1984 by Krishnadas Charitable Trust in New Delhi, offers many esoteric insights into the seemingly simple verses of the Human-Calisa, with evidences (pramana-s) and references from many Hindu scriptures including the Upanisad-s, the Bhagavad- Gita, Valmiki’s Ramayana, the Mahabharata, the Bhagavata Purana and other Purana-s, Nyaya works, Yoga works, and the vast literature of Gosvami Tulasidasa. Scholarly and lucid at the same time, the Mahaviri is replete with the most profound knowledge (jnana) and the most sublime devotion (bhakti). The work was called ‘the best explanation of the Hanuman-Calisa by Dr. Ram Chandra Prasad in his dual-language translation of the Ramacaritamanasa published by Motilal Banarsidass. After the first edition of the Mahaviri was sold out in the 1980s, the book was not reprinted and it remained unavailable for around twenty-five years. I had been looking for the book since 2011 after reading about it in Prasad’s translation of the Ramacaritamanasa, but all efforts to locate the book and the publisher did not yield any fruit. In May 2013, the extensive search which lashed two years came to an end when a copy of the book was made available to me by Prabhat Kumar Dokay of Chhapra. Within a month’s time, the second edition of the book was published, which I co-edited with Dr. Ramadhar Sharma of Patan. In addition, the commentary was digitized and made available online. As the Mahaviri is in highly Sanskritized Hindi, I thought of translating it into English in order to benefit Hanuman devotees who are unfamiliar with Sanskrit and Hindi. The translation began towards the end of 2014 and was completed by March 2015. The average English reader does not have the same context as an average Sanskrit or Hindi reader, so the translation has been expanded at some places to facilitate better understanding. At several places, additional interpretations from other works of Gurudeva have been added. 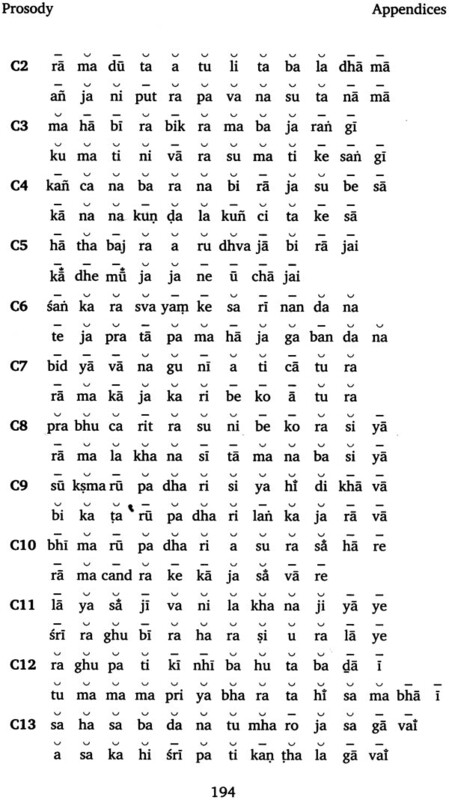 The Hindi commentary provided meaning of only difficult words in the sabdartha(word-meaning) section. This has been expanded to cover all words in the original verses, so that readers can relate to each and every word in the calisa. The introduction and the commentary together have more than 150 Sanskrit and Hindi citations-all of these have also been translated into English. Eight verses in the introduction and the commentary are the commentator’s own compositions- these have also been translated into English. For advanced readers, I have provided endnotes which further elaborate on the subject matter. 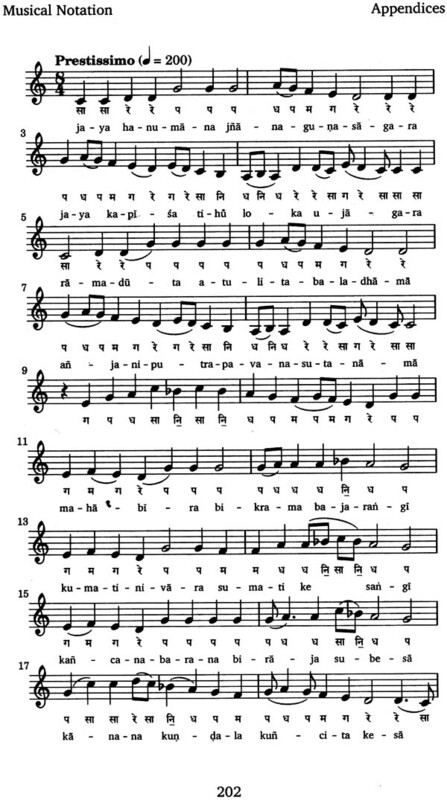 For the benefit of reciters, singers, and instrumentalists, I have authored two appendices on the calisa’s prosody and the musical notation of its popular traditional melody. A half-verse index and a word index have also been included to aid readers who want to look up a specific verse or a word in the calisa. While authoring, designing, and typesetting this book, it has been my attempt to keep it free from all types of errors. I request readers to inform me of any inadvertent errors that may have remained in the book, so that they can be corrected in future editions. This book owes its existence to countless people, and it is impossible to name all of them. I would first mention my late grandparents, Srimati Kausalya Devi Misra and Sri Srigopal Misra, to whom I owe my love of the three treasures of humans-literature, music, and art. The list of authors and editors of the many books and articles I have referred to is endless, and I am indebted to everyone on the list. Scholars on the Bharatiya-vidvat-parisat discussion group have been my friends, philosophers, and guides for the past few years, and they have helped me with several academic sources and references used for the endnotes. The selfless members of the TEX-LATEX Stack Exchange came to my rescues whenever I ran into typesetting problems. I am immensely grateful to Dr. Ramadhar Sharma of Patna and Prof. Animesh Kumar of IIT Bombay for proofreading the draft and offering many useful suggestions to improve it. Ramesh Kalicharan of New York helped me get in touch with ‘Didiji‘ Nandini Sharan, who was very kind to help me with the nuances of the renditions of the calisa by ‘Dadaji’ Hari Om Sharan. Chandramouli Rotti of Gandhinagar offered invaluable help with the appendix on musical notation. Many improvements in the aesthetics, layout, and presentation of the book were suggested by Manish Modi of the Hindi Granth Karyalay in Mumbai. I consider it an honour that this book carries a painting by the late Bhanwarlal Girdharilal Sharma, of India’s finest painters in the twentieth century, on its front cover. I am deeply indebted to Mukesh Sharma and Harsh Sharma of the B. G. Sharma Art Gallery in Udaipur for kind permission to use this artwork. Special thanks go to Prof. Philip Lutgendorf, Professor of Hindi and Modern Indian Studies at the University of Iowa, for kindly reading one of the first drafts of this book and encouraging me with his kind remarks. From the beginning to the end, my parents and my family have supported this effort of mine in every possible way, and I can never repay the debt I owe them. There are no words to express my gratitude to my Gurudeva, Jagadguru Ramanandacarya Svami Ramabhadracarya, Who blessed me by taking time out of his extremely busy schedule to answer my questions that had come up while translating the commentary and his original verse. I believe it is noting but the grace of Hanuman Ji Maharaja which made me embark on this endeavour, and I pray that may the same grace make me worthy of serving Laksmana, Mother Sita, and Lord Rama.